Has become the chief cornerstone." I would never have attempted to write this book, if there was not such phrase as “winners write history.” Instead, the phrase of “often what you see isn’t real, and what you don’t see, real” as the motivation behind my work. I strongly believe that the truth is neither obviously known nor visible, but must be sought like gold or diamond for which you have to dig. I labored on this book, about the Paekche Kingdom, written in a literary form instead of an academic form to convey my emotional response through Junich Takamuku, an invented character. Unfortunately the kingdom is now almost unknown to the world, since another conquered it, more than a millennium ago. I have carefully described the origin of the kingdom, its development, its immortal beauty and eternal dignity. I must say that this is not the complete picture of the Paekche. But there is always room for improvement, to discover greater truth about the kingdom through research into the former kingdom, both in the Korean Peninsula and Japan, to obtain a more comprehensive view. I hope you, dear readers, will reveal in the spirit of the Paekche that is reflected in their perfect craftsmanship and immortal art. I sincerely hope that this book will stimulate students to enquire further into the Paekche way of life. 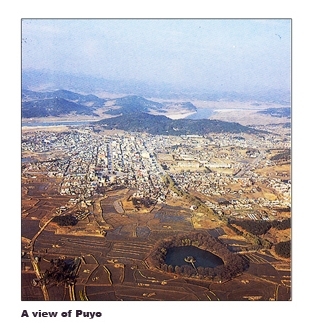 The Puyo tribe of Manchuria founded the Koguryo Kingdom as one of the kingdoms of Kaya, Koguryo, Paekche, Shilla and Lolang in the Korean Peninsula. The Koguryo was situated in the northern part of the peninsula stretching across Manchuria, the Lolang the northeast, the Packche in the southwest, the Shilla the southeast and the Kaya in the south. Each of the five kingdoms developed their own culture and military power, while they were fiercely fighting against each other to expand their territories. Periodically the five kingdoms allied with each other to maintain their own dynasties. Each of the kingdoms developed their own arts and architecture after extensively remodeling Chinese culture. 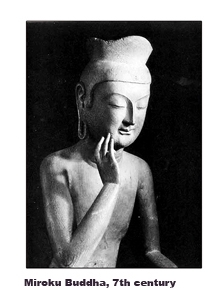 As the predominant religion, Buddhism heavily influenced their art. The rulers of each kingdom used Buddhism as an effective tool for unifying the people. The Lolang, the smallest kingdom, collapsed in 313AD. The Paekche took half of the Kaya near the southeastern of the Korean Peninsula in 512AD and the Shilla conquered the Kaya in 562AD. Then the Paekche conquered the Kaya in 642AD. 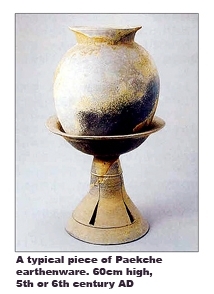 Since then the Koguryo, the Shilla and the Paekche remained as the principal kingdoms of the Korean Peninsula. The Paekche had the most advanced culture among the three kingdoms. It had excellent architecture, astronomy, art and political structure. Paekche’s art was distinctive, refined and sophisticated. Roughly the whole Paekche culture was like a gigantic artisans’ workshop, with thriving architecture, sculptures, paintings and metal works being produced. Simplicity in art is distinctively the Paekche style. The arts of the Paekche are immortalized in the smiling images of Buddha, murals, architectures andthe round end of eave tiles, which had simple designs of lotus flowers. The Paekche also heavily influenced China and Japan, both culturally and politically, and played a leading role in international trade with the various southern Chinese states, and with Japan. Entire southern parts of China and Japan existed as the territories of the Paekche and were a maritime empire, similar to the influential Roman Empire and the Greek city-state, Athens. The Paekche even provided advanced culture to its rival kingdom, Shilla. Basically the Koguryo and the Paekche have similar cultures. The Paekche broke out from the Koguryo. This is shown through the murals of tombs. The founder of the Paekche, King Onjo, is the son of King Tongmyung, the founder of the Koguryo. In 660 AD, the Paekche fell to the allied troops of Shilla and Tang. The Shilla Kingdom conquered the Koguryo and united the peninsula in 668 AD. Although the Paekche lost its power in the Korean Peninsula, where it was founded, its civilization was not completely extinguished. In fact,the civilization of the Paekche also sprang from Asuka in the Nara Prefecture, Japan, from the late 4th century. 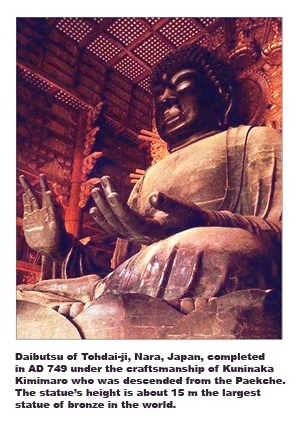 The Paekche introduced Buddhism into Japan in the end of 4th century. Asthe result, Asuka, the ancient capital of Japan, became another artisans’ workshop based on Buddhism.The civilization of the Paekche gradually took deep root in Asuka and spread to the whole of Japan. You could see the assimilation of the Paekche civilization in the distinctive style of Buddhist temples, gardens, wooden statues of Buddha, murals and many other crafts. Even today, Asuka village remains as an archeological site where many cultural properties were buried. Unable to separate the Paekche Kingdom and Japan to understand the Paekche culture as a whole is like you can’t omit even one voice out of alto, tenor, or soprano, and bass for a motet. He was still looking at it. He was again looking at it. He was simply looking at it. He viewed it from many different angles. Probably people who saw him might think that he was an insane. Indeed, he was obsessed about something. He was looking at it like one looking at a sculpture in an art museum or in a park. He was looking at it with his heart pounding. It was not a mysterious object he was looking at. It was a religious monument. It was an ancient monument. 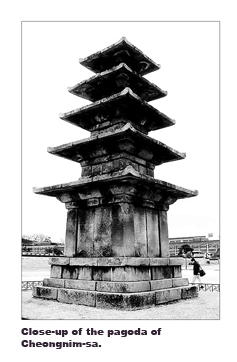 It was a five-story granite pagoda. It was not creamy-white granite but pure nothing added with different materials. It had the color of the plumpness and sleek curves of plain coarse and dark gray Paekche earthenware displayed in antique shops or museums. 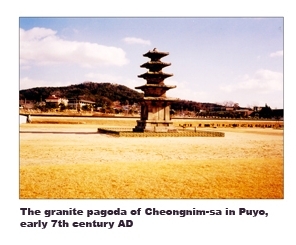 The pagoda had both a timelessness and beauty standing in the center of a ruined Buddhist temple located in the center of Puyo as the last capital of Paekche Kingdom. He, Junichi Takamuku, was looking at it across the flatness of the yellowish-brown earth. The earth rectangular-shaped about the size of a soccer field was flat clean and hard, but not frozen any more, surrounded by gentle hills covered with red pines. The smooth clean earth made the standing-figurelook, in a distance, small and insignificant. But it was huge, strong and ancient, which made him insignificant standing by it. It stands firm and proud. It stands firmly on the broad stable ground stone its foundation. Several places of the bottom surfaces of ground stones were chipped slightly to fit to the natural contours of the earth.The preservation of plain little stones in their original positions portends out that the natural environment has priority over the artificial environment. It looked mysterious, sophisticated and unique. It was simple, humble, yet, graceful. It was a combination of art, religion and algebra. Strangely, he now heard the peculiar melody of J.S.Bach weakly but crystal clear to his ears as he slowly walked up toward the pagoda. The volume increased as he drew closer. Then he looked up as the violin solo drifted out softly, loudly and clearly. Facing it, he felt greatness and hugeness and warmth of the pagoda. Each surface of the stone was not mirror-smooth but rather coarse. He walked slowly around and gazed at it up and down, down and up, over and over again, from many different angles. There were several huge-spaces on which you could slide your spread-out hand between the joints of the weathered stones. You could feel a sense of artistic value from the imperfections and, yet, you could see proportional perfection of the pagoda like a perfect circle of the sun when you never consider the vertical jets of gas, which it produces. He felt impelled to circle around it many times, like a little boy on a merry-go-round, as he looked up at the body of it closely and carefully with the music loudly, mournfully and philosophically coming out from the stones. He looked at it up and down on one side, then the other and the other thoroughly. He could almost feel the coarse yet smooth feeling of its surfaces. Underneath the eaves of its five-tiered roofs were shadowed as he looked up at against the gray sky of late winter that reminded him of the identical eaves of five-tiered tiled roofs of the wooden pagodas in Japan. The edge of a roof chipped off partially. It made the edge of the roof thinner. Did bullets do that? He looked up at the extremely wide spaces between the two surfaces of the stones. Did the vibration of galloping horses widen the spaces between the two surfaces of stones, if not, was it deliberate? Or did the tanks do that? Or did time do that? Strangely he had an affinity with the strangely shaped chunks of cold granite that cut out of the mountain. But he felt it was warm. The hard granite looked so soft that it would urge you to walk up and touch it gently like you would stroke a cat. He really loved to look up at it. Strangely the more he looked up at it, the more he loved to look up at it, like being magnetized by a great painting. It looked meek, strong and deep. He didn’t care about things, which give you, no strong feeling, but, the sense of superficial beauty, such as clean and sharp photographs or fine paintings of flowers, mountains or lakes, for which no inspiration required,unless you force yourself to love it. Because there is only skill involved in facile beauty but not soul. What he cared for were photographs or paintings or sculptures that were rather dull, hard to understand, at one look. He cared about art made with passion rather than smooth sailing of skill. He had no appreciation for those sweet easy works done under the name of commercialism for the eyes, but not for the hearts of people. As the high-pitched peculiar melody emerged from the pagoda continuously, he felt he was bathed in a shower of music, as he looked up at it. It looked like a gigantic man whose tatters and bruised skin couldn’t hide his dignity. It showed harsh reality as the tragic symbol of a defeated kingdom. Then the sharp and thin melody of “Chaconne” turned into the screaming of 3,000 young Paekche ladies who jumped right into the Paengma River from the steep cliff of Puso Mountain in Puyo, rather than be captured by the invading troops. Today people call the cliff, from where those young women plunged, Nakwha-arm, as a symbol of noble allegiance Paekche ladies. The name means flowers falling in the wind. Then he heard the hissing sound the volleys of arrows made, thuds of galloping, and crashing sounds of swords in Hwangsanbul, a battlefield, near Puyo. Commander Kyebeck of Paekche fought bravely with his troop of only 5,000 soldiers against 50,000 soldiers of the Shilla, while 100,000 soldiers of Tang crossing the Paengma River, discoloring the earth with rushing out of hot blood. He took the life of his beloved family, not wanting them to be enslaved by the enemies, before he faced the battlefield. Although he had the heart of a lion, he obviously knew that he would be defeated by the outnumbering enemy troops. Amazingly, in the first three battles, his troop was victorious against the might hordes but alas perished in the fourth battle. Even in the midst of bitter rivalry and adversity, honor, nobility and compassion prevailed. Commander Kyebeck sent a captive underage boy back to his troops. What a clean good fight, Jimocjo thought. In memory of his valor, mercy and loyalty stands an imposing bronze-statue centrally placed in Puyo, where many cultural properties were buried as an important archeological site, the last capital of the defeated kingdom. Why didn’t Koguryo help Paekche? Why didn’t Koguryo do anything for Paekche? Why didn’t Koguryo help Paekche to defeat the strong allied troop of Shilla and Tang? Did Koguryo want Paekche to collapse? If so, how would it benefit Koguryo? He never thought of this before. Do you think, simply, Koguryo was scared of Tang? Wouldn’t it have been well-balanced battle if Koguryo helped Paekche? Suddenly he felt gloomy noticing that the Chinese characters engraved on the yellowish-gray surfaces of the smooth central pillars of the pagoda, but weather and rain made them difficult to read or to see clearly. Reading of the characters worn out by time was like reading hieroglyphics of ancient Egypt. It looked as if the legal codes of ancient Greece were inscribed on the surface of stone, safeguarding the rights of people. Strangely the musical undertones seemed to endorse that this great pagoda had been vandalized by the conqueror, when the commander, Su Ting-Fang who commanded the Tang troops, inscribed his name and his military achievement on this religious monument. “Hello,” he said to the giant pagoda. “Hello,” the pagoda seemed to reply. “Plenty. But all gone. Nine days and nine nights were needed to burn all the temples, and palaces of the Paekche were also turned to ashes. Not a single temple nor a wooden pagoda was left,” breathed he pagoda. “The sad thing, my friend, is that there is not a single wooden Buddha left. All disappeared in the flames. Otherwise it could be like Athens or Rome, he thought. But all the wooden temples and palaces couldn’t compete against fire. Completely burnt, he thought. There wasn’t even a wooden column standing to show that there was ever a temple there unlike the great columns, which remain are standing in Rome or in Athens. Very sad! Everything came from the earth and returned to the earth, he thought philosophically. The flatness of this former kingdom made himempty in the pit of his stomach. Junichi Takamuku turned around and started to walk away but soon stopped, turned, and walked over again. The pagoda seemed to call him to come back. It seemed to hunger for more for a human touch. “We sent a lot of craftsmen and monks to Japan. Those people did many good things here? Did they continue?” he heard it say. The pagoda seemed pleased enormously. The volume of the music had diminished.